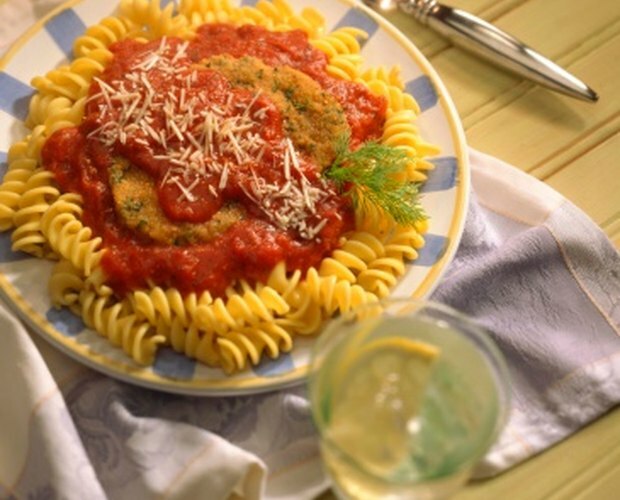 Breaded eggplant is commonly used in a variety of different Italian dishes, and it is often served as a side dish to compliment pasta and meat main courses. While breaded eggplant is best eaten immediately after cooking it, you can keep it in the refrigerator for up to 24 hours to be eaten later. The eggplant may not be quite as crispy as it was originally, but it’s well worth keeping extra eggplant if it is reheated properly. Place the breaded eggplant slices on a baking sheet large enough to hold the eggplant sliced without touching covered with wax paper. Lightly brush both sides of the eggplant slices with a very small amount of extra virgin olive oil and add any fresh or dried herbs or seasonings or salt and pepper you want to use to flavor the eggplant. 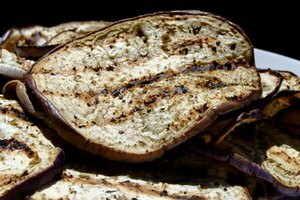 Place the eggplant slices in the oven for 15 minutes. Flip the eggplant slices and heat them for an additional 10 minutes. Remove the baking sheet from the oven and transfer the hot eggplant slices to a wire rack with a pair of heavy tongs to cool. Allow the eggplant slices to cool for five minutes before serving. If the eggplant is already fully seasoned, you don’t need to add more seasonings. However, basic fried or baked breaded eggplant may need additional seasonings if you are using them for a different recipe. 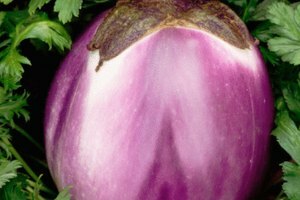 Herbs like dill, tarragon, herbes de Provence, thyme, oregano and rosemary are all commonly used to season breaded eggplant. Use seasonings that compliment the other dishes you are serving or the recipe you are using the eggplant in along with any wire or beer you may be serving. 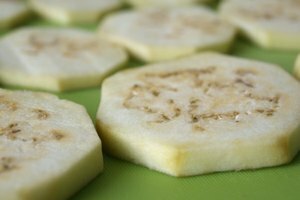 Frozen eggplant slices will take about twice as long to cook and will not retain the same crispy texture. If possible, avoid freezing eggplant slices. 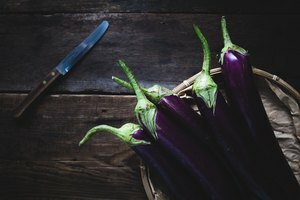 Eggplant breaded using eggs should be discarded after 24 hours if it has not been reheated and eaten because of the potential for food-borne illness.